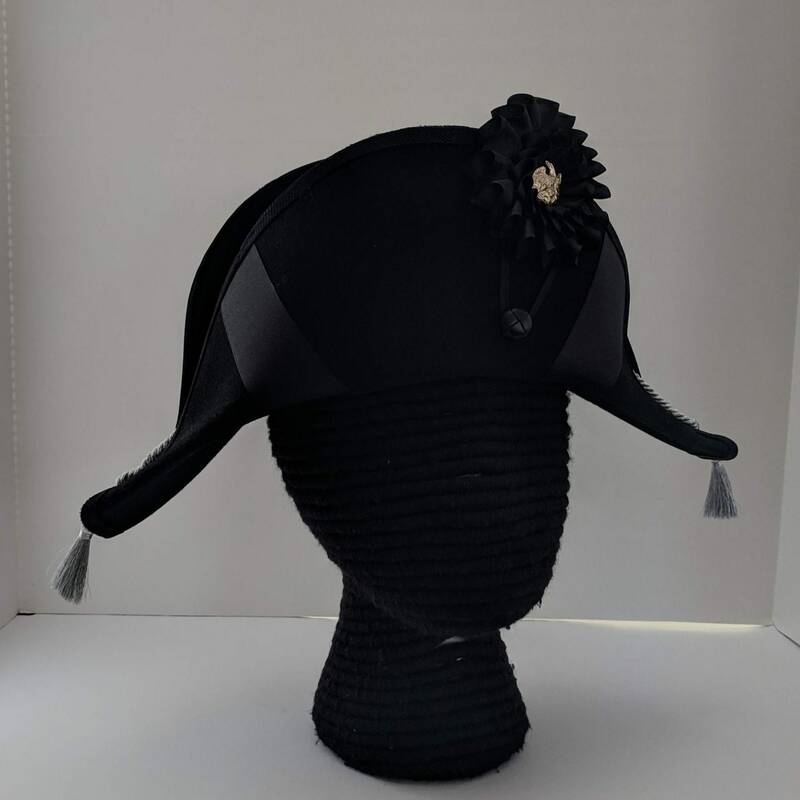 This colonial two cornered hat is made from top quality wool felt. It's a real hat, not a cheap costume cloth one! The edges have been trimmed with black fold-over braid. The brim had been "cocked" with waterproof adhesive. 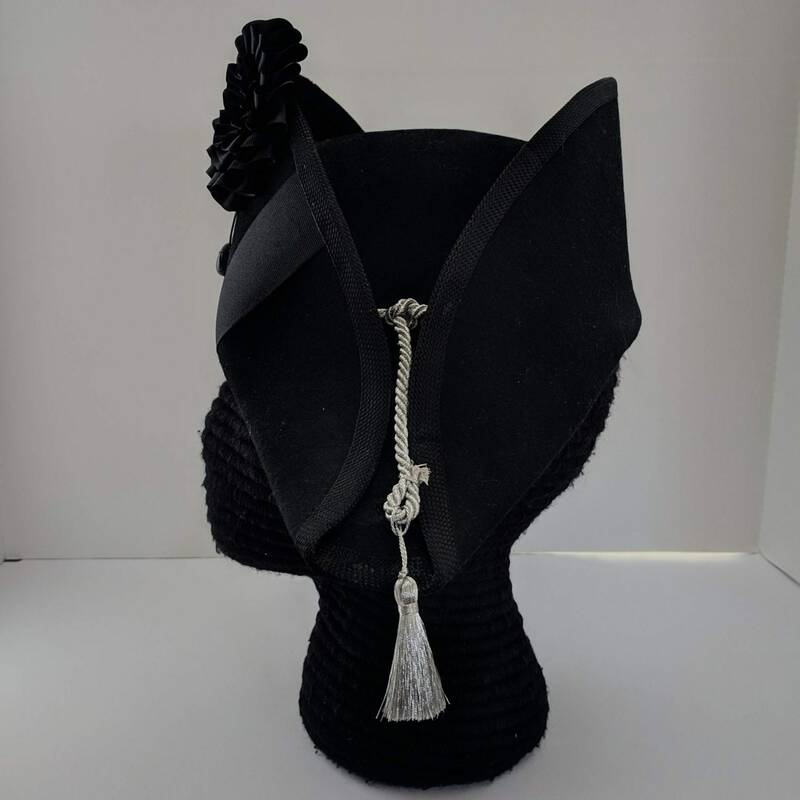 This hat was made to be worn side to side with a flat front. The last picture shows an illustration of a U.S. Army general wearing a similar cockade; however, his has the next version of the eagle insignia that was worn from 1821 - 1851. (This illustration is from "The United States Infantry: An Illustrated History, 1775-1918" by Gregory J.W. Urwin, Pg. 46). Generals typically wore gold, while Colonels wore silver. The wool felt body will be blocked and sized when finished. 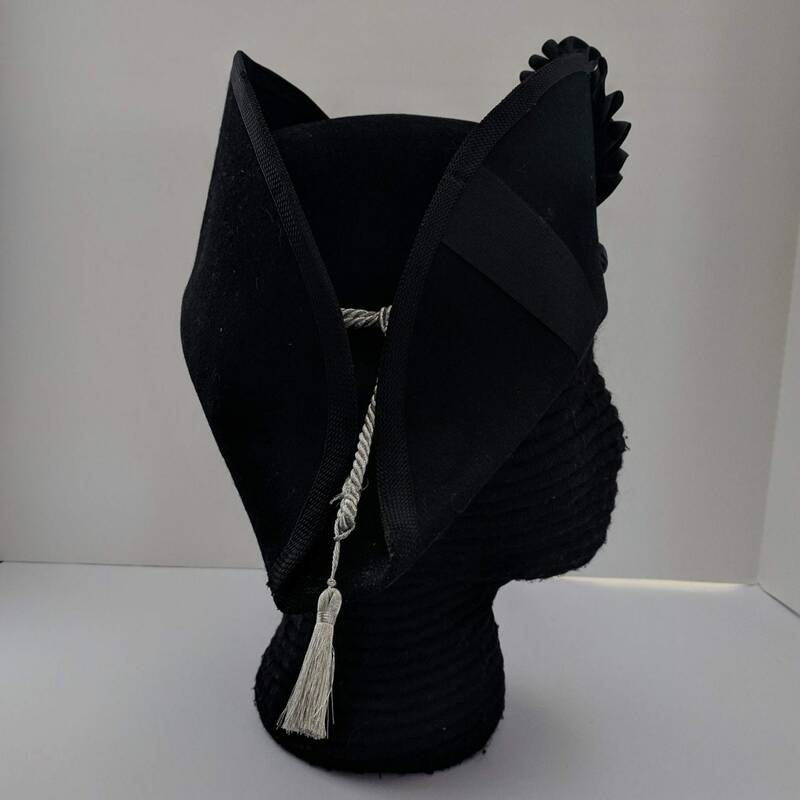 NOTE - Made to Order - Please allow at least 3 days for us to make this hat especially for you! Measure around your forehead if you are unsure of your size. If you will be wearing a wig with this hat, please measure while wearing the wig. If you do not have the wig yet, we will add an extra size to help accommodate it. Just let us know! 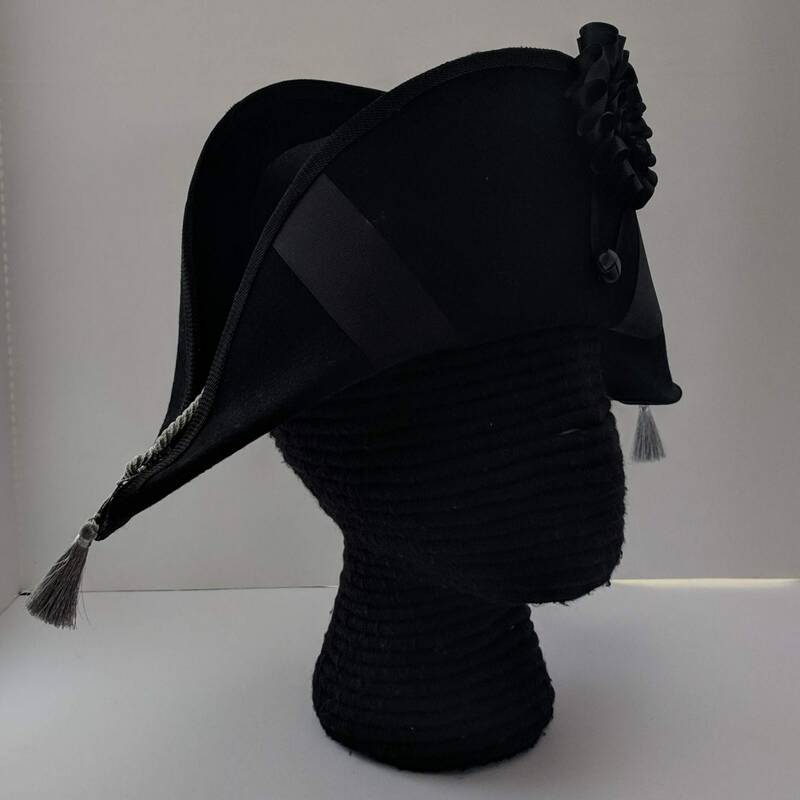 HISTORY: The bicorne or bicorn (two-cornered/horned or bihorn) is a historical form of hat descended from the tricorn. It was widely adopted in the 1790s as an item of uniform by European and American military and naval officers. Worn in America in the War of 1812. 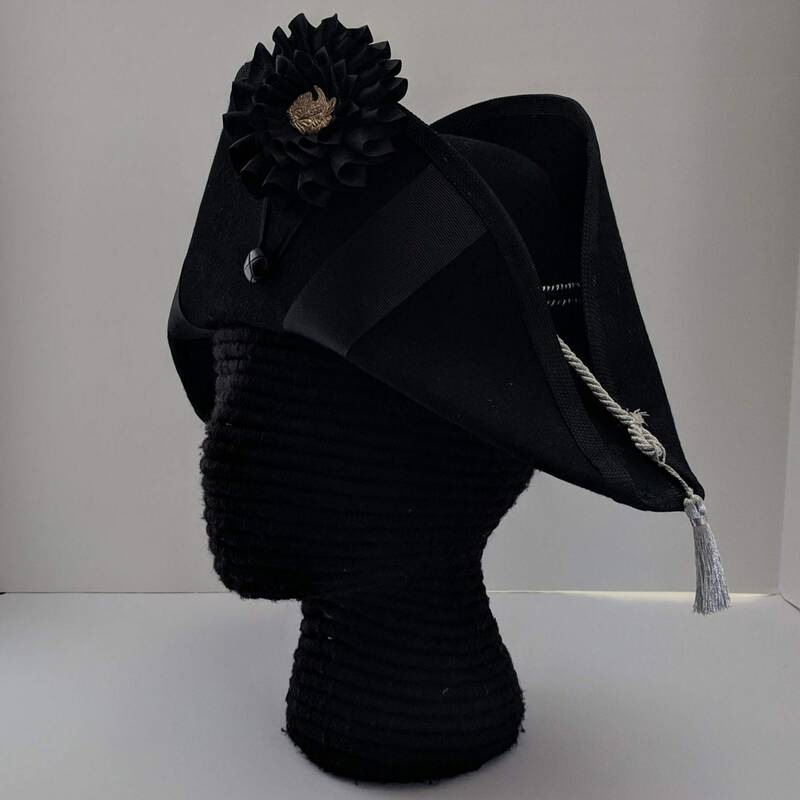 It is now most readily associated with Napoléon Bonaparte (1769-1821) but in practice most generals and staff officers of the time period wore bicornes, and it survived as a widely worn full-dress headdress until at least 1914. 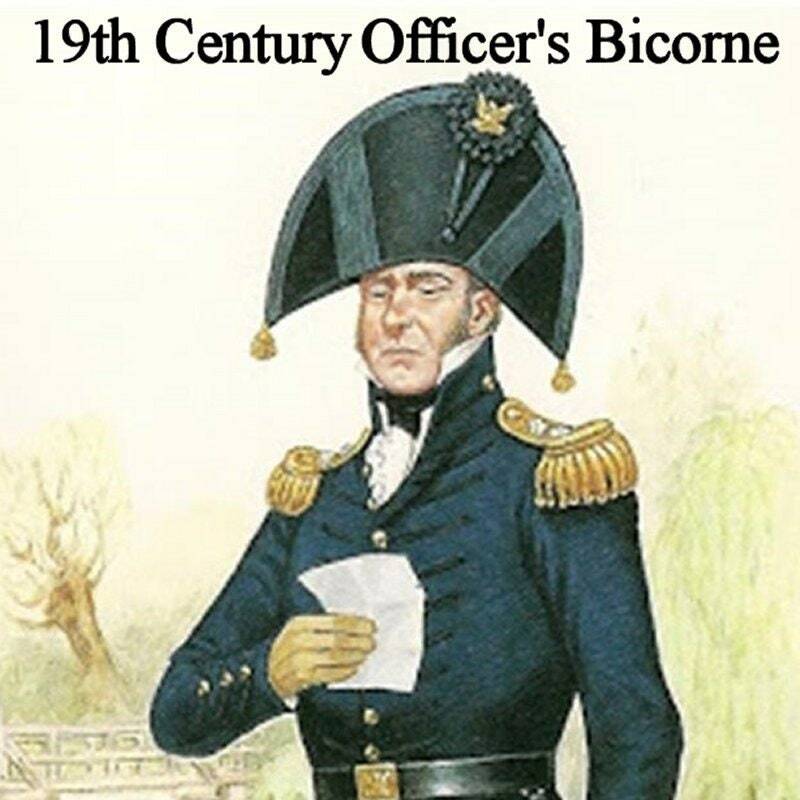 The bicorne was widely worn until World War I as part of the full dress of officers of most of the world's navies. It survived to a more limited extent between the wars for wear by senior officers in the British, French, US, Japanese and other navies until World War II but has now almost disappeared in this context. Bicornes ranged from the very simple to the extravagant, occasionally incorporating gold or silver lace trimming and feathers especially for officers. In addition, military and naval versions usually bore a cockade or other national emblem at the front or right side, depending on how the hat was worn. 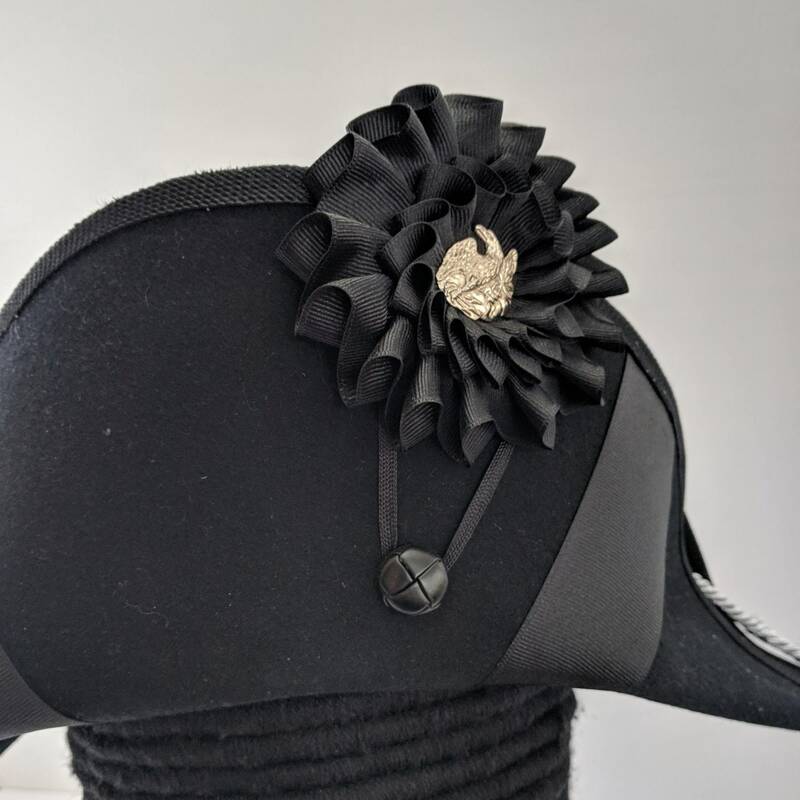 Worn in the side-to-side "athwart" style during the 1790s, the bicorne was normally seen fore-and-aft in most armies and navies from about 1800 on. The French gendarme continued to wear their bicornes in the classic side-to-side fashion until about 1904 as do the Italian Carabinieri in their modern full dress. 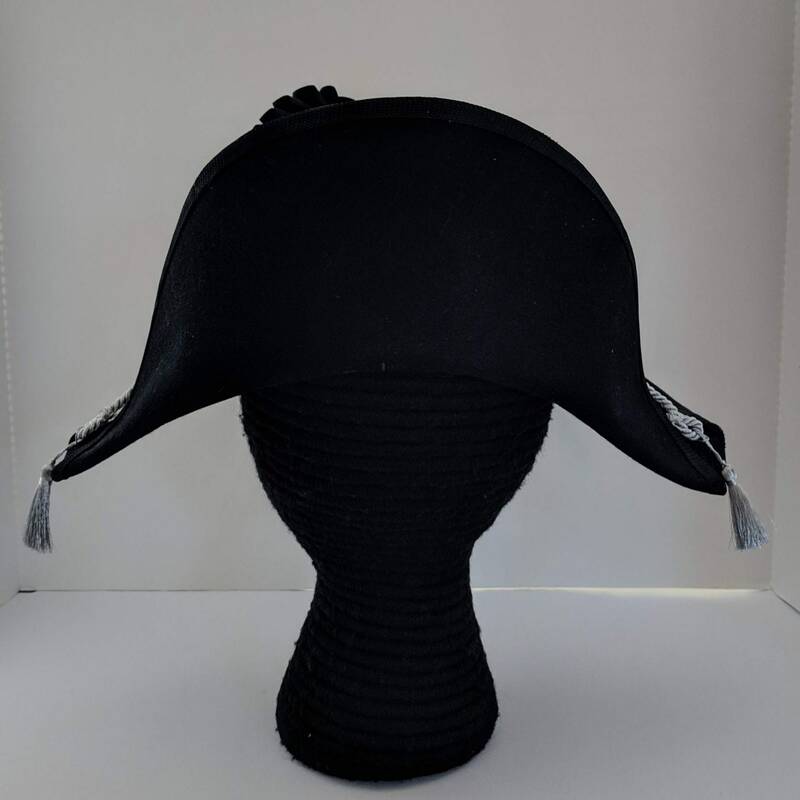 During the early years of the revolution (1775) the colonist wore cockades of various colors to mark the officer's rank; however, in 1780 they reverted back to wearing the black cockade they inherited from their mother country and added a smaller white one on top of the black cockade to show their alliance with France during the war. In 1790, the solid black cockade was re-established with a white (silver) eagle in the center and was still worn in the War of 1812. QUOTE by James McHenry, January 9, 1799 - "All persons belonging to the army, to wear a black cockade, with a small white eagle in the centre. The cockade of non-commissioned officers, musicians and privates, to be of leather, with eagles of tin." Later the brass eagle was added to designate the artillery units from the infantry. 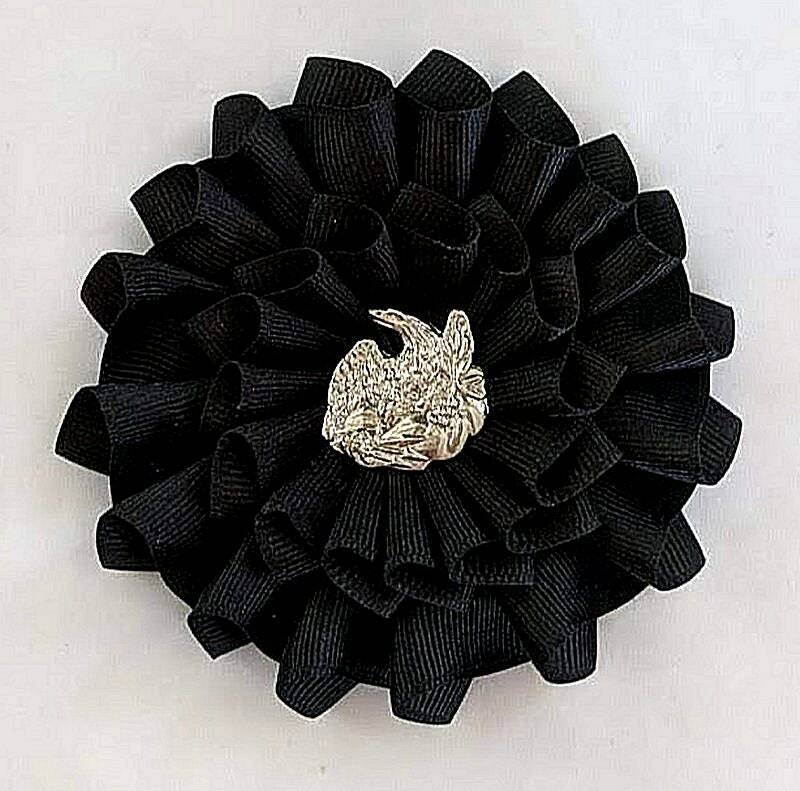 Just the cockade is available in the Cockade and Rosettes section. Look for more hats in our Hats & Headwear section.